Pleasingly luxurious but with a friendly, personal touch, a stay at Villa Atavyria is all you could want it to be. On the coast of Rhodes, between Kolympia and Faliraki. Pleasingly luxurious but with a friendly, personal touch, a stay at Villa Atavyria is all you could want it to be. 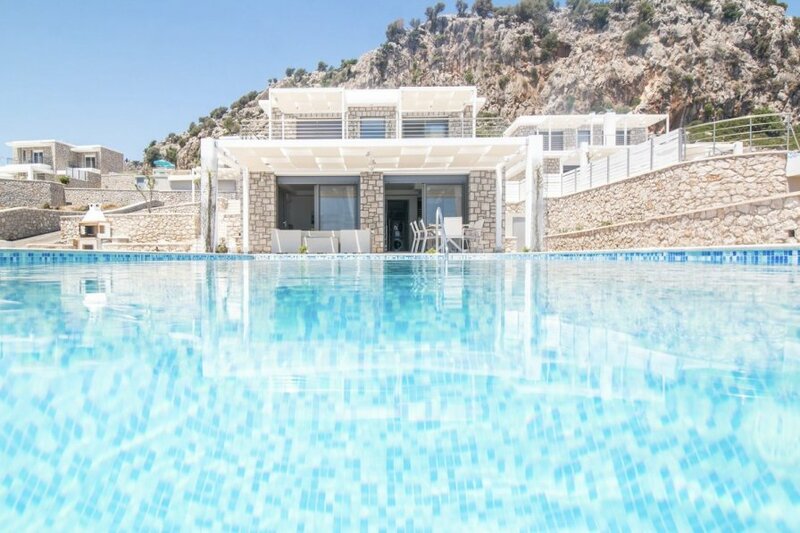 On the coast of Rhodes, between Kolympia and Faliraki, this stunning villa in Afandou offers breathtaking sea views, landscaped gardens and stylish interiors, all just a 5-minute drive from Afandou's Blue Flag beach. Outdoor living is good at Villa Atavyria, with a covered terrace with dining table, chairs and barbecue one of its highlights. You have a pool with sun loungers, a barbecue and plenty of seating, so you can enjoy the sea air at any time of day. Inside, this carefully designed villa offers all the entertainment you could need, with a flatscreen TV with satellite channels and a surround sound music system, plus lots of space to chill out and eat. There are comfortable sofas and a dining table with a view of the ocean plus a well-equipped kitchen in the open-plan living area. The villa has four bedrooms, three of which feature a large double bed. The fourth has twin beds. All of the bedrooms have a smart en suite bathroom. Air-conditioning and free WiFi are among the extra advantages of Villa Atavyria, where you will be met by the owners who do everything they can to make your stay perfect. Afandou puts you well within reach of all kinds of adventures, whether you're looking to keep it coastal or check out the rest of the island. You are just a short drive from the neighbouring town of Kolympia, with the much-loved Tsambika Beach just beyond. Mountain backdrops and beautiful green spaces make this part of the coast a great place for walking too. For something historic, head to Rhodes' Old Town, around 25 minutes' drive from Afandou, or to the famed Lindos Acropolis. Another must-see is less than 20 minutes away – the stunningly beautiful Epta Piges with its seven springs is a real haven of tranquillity.